Daniel Rizzo was born in Revere, and has enjoyed a successful career, first in the military and later as a business owner, community activist, family man and public servant. A graduate of Emmanuel College in Boston, Dan earned a Bachelor of Science Degree in Business Administration before spending six years serving our nation as a member of the United States Navy. During that time, Dan served aboard the Aircraft Carrier U.S.S. Independence CV-62 and participated in Operation Urgent Fury in Grenada as well as responded to crises around the world including the Persian Gulf and Beirut. Dan is the recipient of the Naval Expeditionary Medal; the Armed Forces Expeditionary Medal; and holds the designation of Enlisted Surface Warfare Specialist. After completing his military service in 1986, Dan returned to Revere where he, his brother Paul, and their father Dan Sr., founded the Rizzo Insurance Group, Inc.
For over 30 years Dan, a recipient of the Certified Insurance Counselor (CIC) designation, has served as President of Rizzo Insurance. 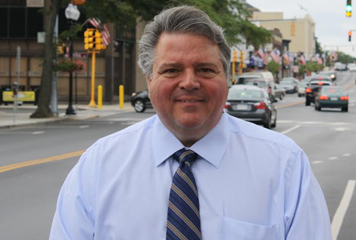 Additionally, Dan has assumed leadership roles in the Revere Business Community including serving as President of the Revere Rotary Club from 1992-1993, and then as President of the Revere Chamber of Commerce from 1995-1997. He is the recipient of Rotary International’s highest honor, the Paul Harris Fellow Award. In 2000, Dan was elected to the Revere City Council, and in 2009 was elected City Council President. In addition, he served as Chairman of the DNC 04 Host Committee which dedicated and marked Revere Beach Reservation as a National Historic Landmark. He was then honored to be elected Mayor of Revere where he served until January of 2016. Dan is married to his wife, Jane Fitzgerald Rizzo. They have two sons, Ryan and Nicholas, and are the proud grandparents of two granddaughters, Aryanna and Elayna. Among his many affiliations and memberships, Dan holds lifetime memberships in the Beachmont VFW, Post 6712 and American Legion Post 61and is a long standing member of the Loyal Order of Moose, Lodge 1272; the St. Mary’s Holy Name Society; and The Benevolent and Protective Order of Elks #1171. Finally, Dan secured $2.72 Million in grant money to kick-start the long overdue construction of a new Harry Dello Russo Stadium at a city cost of just $5.5 Million. This complex includes two new basketball courts, two new tennis courts, and the city’s first ever regulation outdoor track.